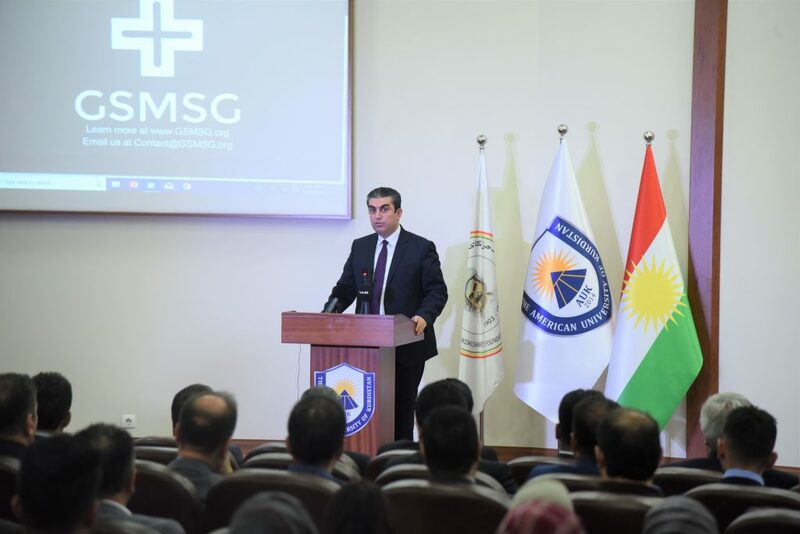 Duhok, Kurdistan Region of Iraq – November 13th, 2018- The American University of Kurdistan (AUK), in collaboration with Barzani Charity Foundation (BCF) and Duhok’s Directorate General of Health (DoH) launched the Medical Professional Development Program for The Global Surgical and Medical Support Group (GSMSG) in a special event held in AUK’s auditorium on Tuesday, November 13th, 2018. Abdulwahid Atrushi, Head of Barzani Charity Foundation – Duhok highlighted the sense of responsibility of the BCF of being present and help where there is a need for humanitarian assistance. Being one of the main partners of this project, the BCF has also operated charity projects outside Iraqi borders such in Turkey, Syria, Greece and Serbia. Dr. Sirwan Mohammed, Representative of Duhok Directorate General of Health declared the number of the cases and patients who will receive treatments from this mission “I would like to take this opportunity to update you about some main points that focal points in our healthcare facilities prepared: at Azadi Heart Center 20 surgical cases are prepared, at Burn and Plastic Hospital: 50 cases are prepared, at Azadi Hospital more than 100 cases prepared, Maternity Hospital 50 cases. All these patient are waiting your support.” Stated Dr. Sirwan in his speech “We are also very happy that Peshmerga will also get treatment within this mission.” He added. This program and partnership has been planned after GSMGS’s visit to AUK on May 2018, and Governor of Duhok, Mr. Farhad Atrushi acknowledged the role of the American University of Kurdistan in bringing such gatherings to the city. For three weeks long, medical development courses for up to a hundred doctors and nurses in Kurdistan will be commenced by The Global Surgical and Medical Support Group as well as providing health care for patients in need. “Not only to treat those in need, but to train our local counterparts. Our mission was, and is, to leave a long lasting impact on our partners.” Stated Dr. Aaron Epstein, founder of the Global Surgical and Medical Support Group. The Global Surgical and Medical Support Group (GSMSG) is a non-profit organization stationed in the United States, dedicated to providing medical relief to communities in conflict zones around the world, while also developing sustainable long-term medical solutions for their healthcare needs. By educating and training indigenous medical personnel in the latest standards of care, GSMSG hopes to build the foundation for a lasting self-sufficient healthcare system.